The Ojo bracelet is one of our top sellers and comes in a variety of colors, perfect for any season and every occasion! 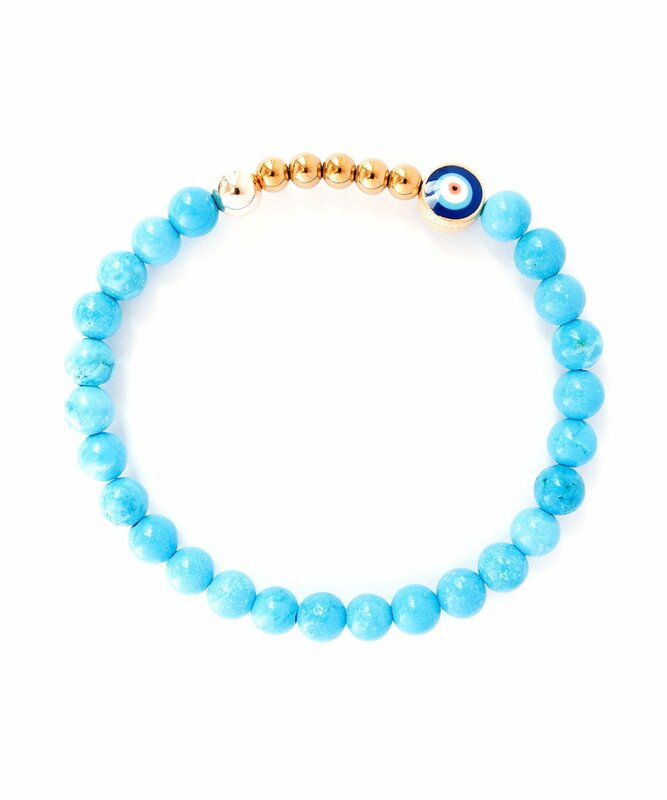 The evil eye provides protection against harm and the five gold hematite beads signify the Five Fundamental Virtues: Wisdom, Love, Truth, Goodness and Justice. Stack up and SAVE on your own Arm Party! Use one of the coupon codes below for a discount on your “Arm Party” items. Select your wrist measurement (not your bracelet size) from the list below and we’ll custom make this bracelet just for you! How to measure your wrist? Wrap your wrist snugly with a soft/sewing measuring tape or thin strip of paper, ribbon or string and then measure the marked length against a measuring tape or ruler. Measure snugly with NO wiggle room. Custom bracelet orders are final sale and can take up to 10 business days to be created and shipped.